Mitchie is a cockatiel that we rescued when he was found flying outside in the Spring of 2006. In August 2006 he started to get a growth where his right wing connected to the body. Within a week it was the size of a kid's marble. He had surgery to have it removed and had to wear that collar to keep him from worrying the wound. They don't make collars for small birds so he had to wear a collar made for a mouse. It was a bit heavy for his little neck and he walked around bent over. We had to help him eat and drink for about month until he was healed and the collar could come off. The bottom painting is Mitch lifting his head in joy after the collar came off. 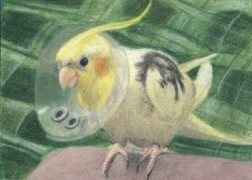 To see more of my art cards please go to ArtCardsWanted or to Tirolese.com to see her official site. This the Ultimate in colors and the moment, The General felt as if he had to stand there scanning the scene. Very talented, I like it a lot. beautiful aceo, I will take a look at all of them on the site later today Ana. Truly spectacular! Tremendous! I Love your colors Combinatione!!!! !